AFAIA | What Does AFAIA Mean? 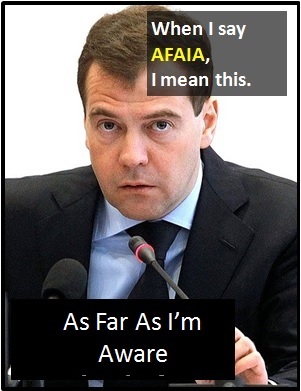 AFAIA means "As Far As I'm Aware". The abbreviation AFAIA is used when the sender wishes to indicate that they are not completely sure of the statement that they are making, but believe it be true. However, it is also often used when the speaker is lying and wishes to be able to deny the lie if challenged. It is a phrase regularly used by politicians and others who may later want to distance themselves from what was said. AFAIA may also be written as AFAIAA (As Far As I Am Aware). Of note, AFAIA is another way of saying TTBOMK (To The Best Of My Knowledge) and AFAIK (As Far As I Know). If I say AFAIA, it means I can later claim I was mistaken. Reporter: Will all of the money saved be invested in the NHS? Politician: AFAIA all of that money will be spent to improve our health service. Maja: Do you think they're going to fire me? Xander [lying]: No, AFAIA they really like you. AFAIA is an initialism abbreviation. Technically, this means it is pronounced using its individual letters (i.e., Aay Eff Aay Eye Aay), but as this is harder to say than "As far as I'm aware," it is not often uttered using its letters. In other words, the abbreviation AFAIA is for efficiency in writing and not efficiency in speech. Before the digital era, we would have just said "As Far As I'm Aware" instead of using the abbreviation AFAIA.